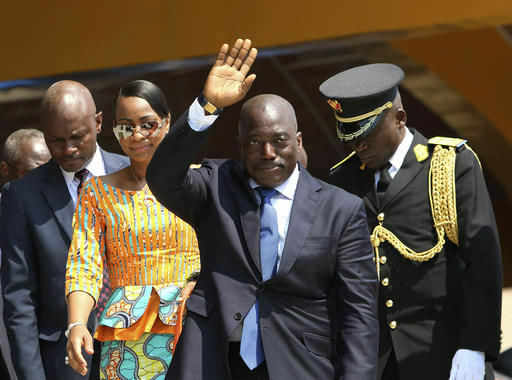 KINSHASA, CONGO (AP) — Talks in Congo between President Joseph Kabila's party and the opposition are on hold after they failed to reach an agreement before the date Kabila was originally supposed to step down from power, mediators said Saturday. Kabila's original mandate ends Monday, and many fear widespread unrest if he stays in office unless some kind of political compromise is reached. Anti-government demonstrations are expected Monday and Tuesday. Police and military forces were already patrolling, searching cars and setting up checkpoints Saturday in Kinshasa, the capital. Authorities plan to cut off access to social networks Sunday for an undetermined period of time. The national election once set for November in this Central African nation has been delayed indefinitely, allowing the president to remain in power until a vote is held. Congolese authorities say that updating the voters' registrar will take until at least until July 2017 and budgetary constraints may delay the election even further. Catholic church officials who have been mediating the talks announced Saturday evening that the negotiations won't resume until Wednesday, raising fears of potential violence in the sprawling nation that has suffered decades of dictatorship and back-to-back civil wars. "Given the breadth of the topics, participants came to the conclusion that these questions should not be dealt with hastily," Monsignor Marcel Utembi said in a statement Saturday, adding that several church officials are now headed to Rome for a few days. "Meanwhile we ask everyone to pray for our country," he added. Opposition leader Felix Tshisekedi said he and his supporters maintain that a new election "must be held and can be held in 2017," despite calls from the presidential majority to hold them in April 2018. Opposition parties also want political prisoners released and for the case to be dropped against opposition politician Moise Katumbi, who left the country after prosecutors said they would charge him with hiring mercenaries for his protection. Justice Minister Alexis Thambwe Mwamba said the presidential majority was taking part in the talks with "an open mind to put an end to the crisis." He said while some prisoners could be released immediately, others might have to be pardoned by a commission. Kabila came to power in 2001 after the assassination of his father. Congo suffered through years of civil war, and some observers fear that tensions over Kabila's continued rule could once again unleash fighting in the mineral-rich country. Massive demonstrations broke out in Kinshasa and several other cities across Congo in September when the electoral commission failed to call an election and clashes with police left over 50 people dead. U.N. High Commissioner for Human Rights Zeid Ra'ad Al Hussein said Saturday that concerns about unrest are high, especially since "no one to date has been held accountable" for the protesters' deaths in September. "We call on the government, and especially its security forces, to take all necessary measures to guarantee the rights to freedom of association and of peaceful assembly," he said.